Vieques (/viːˈeɪkᵻs/; Spanish pronunciation: [ˈbjekes], locally: [ˈbjeke]), in full Isla de Vieques, is an island–municipality of Puerto Rico in the northeastern Caribbean, part of an island grouping sometimes known as the Spanish Virgin Islands. Vieques is part of the Commonwealth of Puerto Rico, and retains strong influences from 400 years of Spanish presence in the island. Vieques lies about 8 miles (13 km) east of the Puerto Rican mainland, and measures about 21 miles (34 km) long by 4 miles (6 km) wide. Its one main town Isabel Segunda (sometimes written "Isabel II"), the administrative center on the northern side of the island. The population of Vieques was 9,301 at the 2010 Census. The island's name is a Spanish spelling of an American Indian word (likely Taíno) said to mean "small island". It also has the nickname "Isla Nena", usually translated from the Spanish as "Little Girl Island", alluding to its perception as Puerto Rico's little sister. During the colonial period, the British name was "Crab Island". Vieques is best known internationally as the site of a series of protests against the United States Navy's use of the island as a bombing range and testing ground, which led to the navy's departure in 2003. Today the former navy land is a national wildlife refuge, with numerous beaches that still retain the names given by the navy, including Red Beach, Blue Beach, Green Beach and others. The beaches are commonly listed among the top beaches in the Caribbean for their azure-colored waters and white sands. Archaeological evidence suggests that Vieques was first inhabited by ancient American Indian peoples who traveled from continental America perhaps between 3000 BC and 2000 BC. However, estimates of these prehistoric dates of inhabitation vary widely. These tribes had a Stone Age culture and were probably fishermen and hunter-gatherers. Further waves of settlement by Native Americans followed over many centuries. The Arawak-speaking Saladoid (or Igneri) people, thought to have originated in modern-day Venezuela, arrived in the region perhaps around 200 BC (again estimates vary). These tribes, noted for their pottery, stone carving, and other artifacts, eventually merged with groups from Hispaniola and Cuba, to form what is now called the Taíno culture. This culture flourished in the region from around 1000 AD, and survived on Vieques until the arrival of the Europeans in the late 15th century. The European discovery of Vieques is sometimes credited to Christopher Columbus, who landed in Puerto Rico in 1493. It does not seem to be certain whether Columbus personally visited Vieques, but in any case the island was soon claimed by the Spanish. During the early 16th century Vieques became a center of Taíno rebellion against the European invaders, prompting the Spanish to send armed forces to the island to quell the resistance. The native Taíno population was decimated, and its people either killed, imprisoned or enslaved by the Spanish. At the beginning of the 19th century, the Spanish took steps to permanently settle and secure the island. In 1811, Don Salvador Meléndez, then governor of Puerto Rico, sent military commander Juan Rosselló to begin what would become the annexation of Vieques by the Puerto Ricans. In 1832, under an agreement with the Spanish Puerto Rican administration, Frenchman Teófilo José Jaime María Le Guillou became Governor of Vieques, and undertook to impose order on the anarchic province. He was instrumental in the establishment of large plantations, marking a period of social and economic change for the island. Le Guillou is now remembered as the "founder" of Vieques (though this title is also sometimes conferred on Francisco Saínz, governor from 1843 to 1852, who founded Isabel Segunda, the "town of Vieques", named after Queen Isabel II of Spain). Vieques was formally annexed to Puerto Rico in 1854. In 1898, after Spain's defeat in the Spanish–American War, Vieques, along with mainland Puerto Rico, was ceded to the United States. In the 1920s and 1930s, the sugar industry, on which Vieques was totally dependent, went into decline due to falling sugar prices and industrial unrest. Many locals were forced to move to mainland Puerto Rico or Saint Croix to look for work. In 1941, while Europe was in the midst of World War II, the United States Navy purchased or seized about two thirds of Vieques as an extension to the Roosevelt Roads Naval Station nearby on the Puerto Rican mainland. The original purpose of the base (never implemented) was to provide a safe haven for the British fleet should Britain fall to Nazi Germany. Much of the land was bought from the owners of large farms and sugar cane plantations, and the purchase triggered the final demise of the sugar industry. Many agricultural workers, who had no formal title to the land they occupied, were evicted. After the war, the US Navy continued to use the island for military exercises, and as a firing range and testing ground for munitions. The continuing post-war presence in Vieques of the United States Navy drew protests from the local community, angry at the expropriation of their land and the environmental impact of weapons testing. The locals' discontent was exacerbated by the island's perilous economic condition. Protests came to a head in 1999 when Vieques native David Sanes, a civilian employee of the United States Navy, was killed by a jet bomb that the Navy said misfired. Sanes had been working as a security guard. A popular campaign of civil disobedience resurged; not since the mid-1970s had Viequenses come together en masse to protest the target practices. The locals took to the ocean in their small fishing boats and successfully stopped the US Navy's military exercises. As a result of this pressure, in May 2003 the Navy withdrew from Vieques, and much of the island was designated a National Wildlife Refuge under the control of the United States Fish and Wildlife Service. Closure of Roosevelt Roads Naval Station followed in 2004. Vieques measures about 21 miles (34 km) east-west, and three to four miles (5 km) north-south. It has a land area of 52 square miles (130 km2) and is located about ten miles (16 km) to the east of Puerto Rico. To the north of Vieques is the Atlantic Ocean, and to the south the Caribbean. The island of Culebra is about 10 miles (16 km) north of Vieques, and the US Virgin Islands lie to the east. Vieques and Culebra, together with various small islets, make up the so-called Spanish Virgin Islands, sometimes known as the Passage Islands. The former US Navy lands, now wildlife reserves, occupy the entire eastern and western ends of Vieques, with the former live weapons testing site (known as the "LIA", or "Live Impact Area") at the extreme eastern tip. These areas are unpopulated. The former civilian area occupies very roughly the central third of the island and contains the towns of Isabel Segunda on the north coast, and Esperanza on the south. Vieques has a terrain of rolling hills, with a central ridge running east-west. The highest point is Monte Pirata ("Pirate Mount") at 987 feet (300 m). Geologically the island is composed of a mixture of volcanic bedrock, sedimentary rocks such as limestone and sandstone, and alluvial deposits of gravel, sand, silt, and clay. There are no permanent rivers or streams. 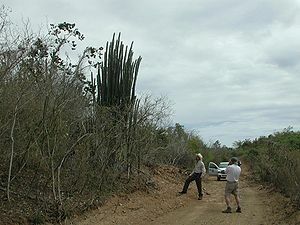 Much former agricultural land has been reclaimed by nature due to prolonged disuse, and, apart from some small-scale farming in the central region, the island is largely covered by brush and subtropical dry forest. The Bioluminescent Bay (also known as Puerto Mosquito, Mosquito Bay, or "The Bio Bay"), is considered the best example of a bioluminescent bay in the United States and is listed as a national natural landmark, one of five in Puerto Rico. The luminescence in the bay is caused by a micro-organism, the dinoflagellate Pyrodinium bahamense, which glows whenever the water is disturbed, leaving a trail of neon blue. Vieques has a warm, relatively dry, tropical to sub-tropical climate. Temperatures vary little throughout the year, with average daily maxima ranging from 82 °F (28 °C) in January to 87 °F (31 °C) in July. Average daily minima are about 10 °F (6 °C) lower. Rainfall averages around 45 to 55 inches (1150 to 1400 mm) per year, with the months of May and September–November being the wettest. The west of the island receives significantly more rainfall than the east. Prevailing winds are easterly. Vieques is prone to tropical storms and at risk from hurricanes from June to November. In 1989 Hurricane Hugo caused considerable damage to the island. Both Spanish and English are recognized as official languages. Spanish is the primary language of most inhabitants. also called Red Beach a name given to the beach by U.S. NAVY. For sixty years the majority of Vieques was closed off by the US Navy, and the island remained almost entirely undeveloped for tourism. This lack of development is now marketed as a key attraction. Vieques is promoted under an ecotourism banner as a sleepy, unspoiled island of rural "old world" charm and pristine deserted beaches, and is rapidly becoming a popular destination. The lands previously owned by the Navy have been turned over to the U.S. National Fish and Wildlife Service and the authorities of Puerto Rico and Vieques for management. Snorkeling is excellent, especially at Blue Beach (Bahía de la Chiva). Aside from archeological sites, such as La Hueca, and deserted beaches, a unique feature of Vieques is the presence of two pristine bioluminescent bays, including Mosquito Bay. Vieques is also famous for its feral paso fino horses, which roam free over parts of the island. These are descended from stock originally brought by European colonisers. In 2011, TripAdvisor listed Vieques among the Top 25 Beaches in the World, writing "If you prefer your beaches without the accompanying commercial developments, Isla de Vieques is your tanning turf, with more than 40 beaches and not one traffic light." Vieques is served by Antonio Rivera Rodríguez Airport, which currently accommodates only small propeller-driven aircraft. Services to the island run from San Juan's Luis Muñoz Marín International Airport, Ceiba Airport or Isla Grande Airport (20- to 30-minute flight). Flights are also available between Vieques and Saint Croix and Saint Thomas. Air Sunshine offers direct service to and from Vieques(VQS) and San Juan(SJU) and connecting service to St.Thomas(STT),Tortola(EIS),Virgin Gorda(VIJ),Anguilla(AXA),Sint Maarten(SXM),Dominica(DOM) and Nevis(NEV) on a regular basis and all other destinations on demand. The 300-year-old ceiba tree in August, 2005.